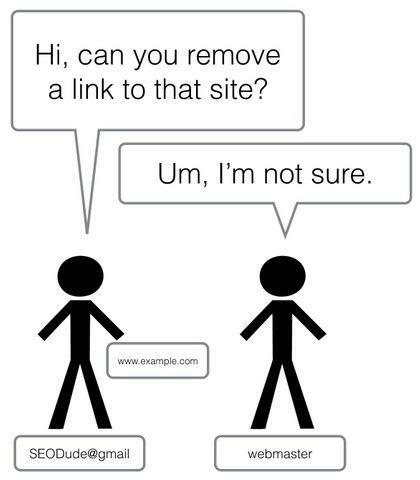 Link removal is simply a process where a representative of a website asks the representative of another website to remove a link from their website. It is done after identifying the bad links on a site. 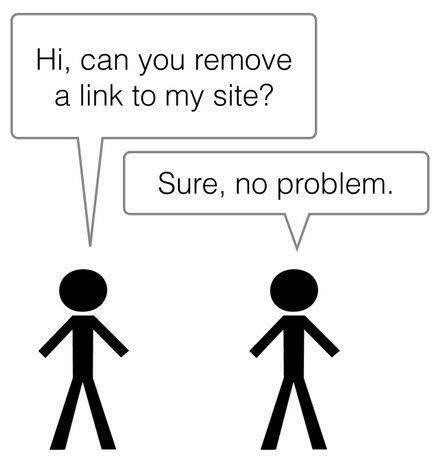 If you are a webmaster and your site have some serious number of back-links to other websites, you must be probably receiving the link removal request on regular basis. Hold your horses because getting a link removed from another website, or removing a back-link on your website is a big deal. There are risks associated with it. Sometimes rogue SEO use the link removal method as a measure to down-rank their competitors as well. So, next time when you receive a link removal request, check if it is genuine. And Next time when you send a link removal request, make sure it looks genuine. Domain address of the email that you are using to connect to another webmaster for link removal is an important element of your whole link removal process. How? Jack sends a link removal request to Jill from his email address “dudejack@gmail.com”. The link address is “example.com/anyrandompage” which has been linked to the page “randomsite.com/anyrandompage”. Jill receives the email. But when she notices the email address from a domain other than Jack’s website, it starts to smell fishy to her. She chooses to not to remove the link neither she replies to Jack. That’s it. Here ends Jack’s link removal request before it even started. This is what that happens when you send a link removal request from a domain other than your website for which the request is being made. Some webmasters use link removal to hurt the SEO of their rival sites, that’s why domain name becomes a crucial factor here. Alice’s has a quite good back-link from Jill’s site on her page “randomsite.com/anyrandompage”. This back-link boosts Alice’s SEO to a great extent. Jack is Alice’s competitor. He thinks about a rogue idea to drop Alice’s rank on this page. He sends a link removal request to Jill from his email address “dudejack@gmail.com”. Jill accepts the request and removes the link from her site. Now Alice lost her precious back-link and SEO ranking starts to degrade on her page. Here, Jack has used a black-hat technique to put down his rival’s ranking. Moreover, Jill unknowingly accepted a link removal request from someone who is not even associated or authorized to send such request on Alice’s behalf. This happened because Jill did not consider the domain address of the sender. scene if Jill would have checked the email domain of Jack. 1. While sending: While sending a link removal request, use an email address associated with the domain for which your requesting. If you are requesting a link removal for your website “www.example.com”, make sure your email address is something like “anything@example.com”. Many a times websites hire an SEO agency to perform the link removal task for their website. In such cases, give the SEO agency and email address associated with your domain so that they can prove that they are working on your behalf. Otherwise, webmasters nowadays are not like Jill, they will not even respond to a request coming from any other domain. 2. Never respond or accept a link removal request coming from an email address not associated with the domain for which the request has been made. They are mostly from the rogue SEOs sending spam requests everywhere.